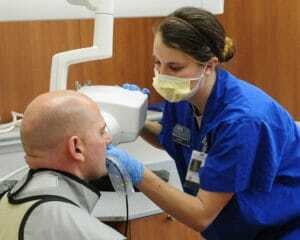 Are dental x-rays safe? Are dental x-rays necessary? People frequently ask us, "Are dental x-rays safe? ", "Are dental x-rays necessary?" Dental radiographs have proven helpful in alerting one to osteoporosis! Stated simply, catching a small problem early can prevent major problems later on. The images below can clearly show a very typical scenario. Image A is what we would see upon visible examination. Image B would allow us to diagnose the presence of significant decay. 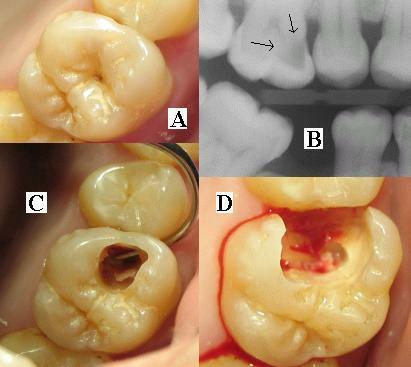 Image C shows how decay penetrates deep into the tooth. Image D shows bleeding from the pulp or chamber where the nerves and blood vessels are housed. Treatment once the nerve is involved is Root Canal Treatment. Only then can restoration of the lost tooth structure can be initiated. It is unfortunate that we see this far more often than we should. Sometimes a tooth that has decay becomes sensitive, or painful. Unfortunately that is not always the case. A tooth can abscess and become infected with little to no symptoms. These unfortunate series of events can usually be avoided with routine diagnostic x-rays. Lower X-ray dose — The single most important way dentists keep their patients safe from radiation is by limiting the dose. An X-ray machine may seem large, but the X-rays come out of a small cone. This limits the rays to an area less than three inches in diameter. X-ray machines also are well shielded. Very little radiation exposure occurs beyond the diameter of the beam. Better film — The speed of films used for dental X-rays has been improved. This means that less exposure is needed to get the same results. Dentists who use the fastest speed film (F-Speed) limit the amount of radiation needed to obtain a good picture. Therefore, patients also are exposed to less radiation. Digital radiography — The use of digital X-rays reduces radiation by as much as 80%. Today more dentists are using this type of X-ray. It's estimated that as many as one-third to one-half of U.S. dentists use this technology. 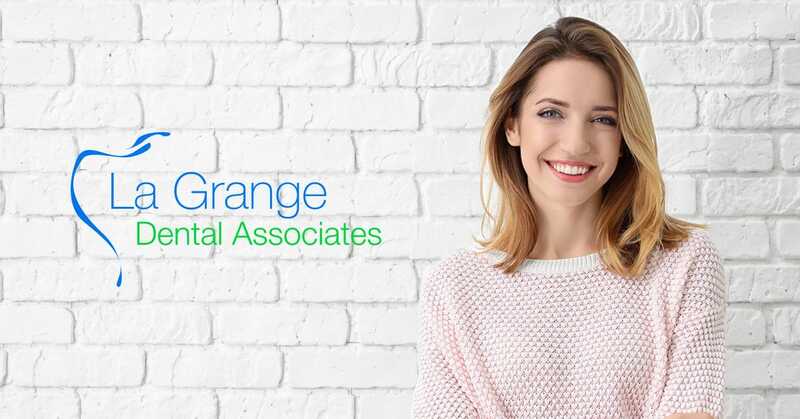 Digital radiography is exclusively used at La Grange Dental Associates. Film holders — Dental patients used to hold X-ray film in their mouths with their fingers. Those days are long gone. Now, holders keep the film in place, no longer exposing fingers to unnecessary x-rays. Lead shields — Before you get X-rays, you will be covered from the neck to the knees with a lead-lined full-body apron. The American Academy of Oral and Maxillofacial Radiology recommends the use of a thyroid collar on patients under age 30. Younger adults and children are at greater risk for radiation-induced thyroid cancer than older adults. These shields have been used for decades, and many states require them. Today, however, they offer more peace of mind than actual protection. That's because modern dental X-ray machines emit almost no scatter (stray) radiation. We always utilize a thyroid collar at La Grange Dental Associates. Limited use of X-rays — Dentists take X-rays only when they believe they are necessary for an accurate dental assessment or diagnosis. La Grange Dental Associates follows the standard of care in exposing individuals to dental x-rays. For a patient with average risk for dental disease, a Full Mouth set or Panoramic x-ray is performed once every 3-5 years depending on individual needs. Bitewing x-rays are the more routine cavity detecting x-rays. Although many insurance companies provide a benefit for these every 6 months, we at La Grange Dental Associates feel that bitewing x-rays are sufficient only 1 time per year. That recommendation may vary for those with higher than usual or lower than usual risk for dental disease. The scientific unit of measurement for radiation dose, commonly referred to as effective dose, is the millisievert (mSv) . Other radiation dose measurement units include rad, rem, roentgen, sievert, and gray. We are exposed to radiation from natural sources all the time. According to recent estimates, the average person in the U.S. receives an effective dose of about 3 mSv per year from naturally occurring radioactive materials and cosmic radiation from outer space. These natural "background" doses vary throughout the country. People living in the plateaus of Colorado or New Mexico receive about 1.5 mSv more per year than those living near sea level. The added dose from cosmic rays during a coast-to-coast round trip flight in a commercial airplane is about 0.03 mSv. Altitude plays a big role, but the largest source of background radiation comes from radon gas in our homes (about 2 mSv per year). Like other sources of background radiation, exposure to radon varies widely from one part of the country to another.To explain it in simple terms, we can compare the radiation exposure from one chest x-ray as equivalent to the amount of radiation exposure one experiences from our natural surroundings in 10 days. Dental x-rays provide a wealth of information not visible to the eye. Most times, routine diagnostic dental-rays can catch early decay and other problems, eliminating the discomfort and cost of treating more extensive dental disease. With the negligible dose needed to obtain a dental x-rays, it is clear that the value heavily outweighs the risks. Always consult with your dentist at La Grange Dental Associates regarding your individual risks and benefits when determining the frequency that is best for you.